Welcome to the six hundred and twenty-second of my blog interviews with novelists, poets, short story authors, biographers, agents, publishers and more. Today’s is with children’s book author, freelance writer, and playwright Natasha Yim. A list of interviewees (blogged and scheduled) can be found here. If you like what you read, please do go and investigate further. Morgen: Hello, Natasha. Please tell us something about yourself, where you’re based, and how you came to be a writer. Natasha: I’m a children’s book author, freelance writer, and playwright living in Ukiah, a small town in Northern California (about two hours north of San Francisco). I was born in Kuala Lumpur, Malaysia, but went to elementary / primary school in Singapore, and high school / secondary school in Hong Kong. My secondary school was actually a British school, King George V School, where a creative writing English assignment by my 1st form (7th grade in the U.S.) English teacher, Mr. Harry, led to my love of writing and creating stories. I have wanted to be a writer ever since I was 11 years old. In my teen years, I kept several journals, and dabbled in poetry and short stories. I attended Dominican College in San Rafael, California, where I attained a Bachelor of Arts in English Literature with a Writing Emphasis, and a Masters of Science in Counseling Psychology. After graduate school, I began working as a counselor / social worker in group homes, foster homes, and finally with Child Protective Services. I would write on my free time, and in my 20s found some success with publication for regional and local newspapers and magazines. In 1996 or 1997, I began to write stories for children, and my first book “Otto’s Rainy Day” was published in 2000 by Charlesbridge Publishing. Morgen: What a great English teacher. I do remember enjoying English at school (I can even remember which books we covered which is about all I remember of secondary school, other than the mandarin cheesecake!). So you began writing children’s stories, is this your main genre, and have you considered other genres? Natasha: I primarily write children’s books, but have written non-fiction articles for both adult and children magazines. My plays, however, are for adults. I did at one time think I’d like to write an adult book one day, but have discovered that I actually have no interest in writing for adults. It’s so much more fun to create stories for children, and there’s nothing like seeing or hearing about a child choosing a book over and over again because they really connect to the story. Plus you get to do school visits and meet the kids! Morgen: It’s funny. I write very little for children and much prefer writing for adults, usually dark stories, but then I’ve never had children so maybe that would help. What have you had published to-date? Do you have a favourite of your books or characters? Natasha: I have published both fiction and non-fiction. 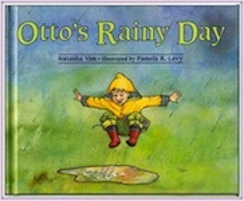 Otto’s Rainy Day is a picture book published by Charlesbridge Publishing in 2000. It was a Kids’ Pick of the Lists selection. Cixi, The Dragon Empress, a biography of the last empress of China was released in 2011 by Goosebottom Books, a small, independent press, as one of six books in their second series, The Thinking Girl’s Treasury of Dastardly Dames. This series was recently named Booklist’s Ton Ten Juvenile Non-Fiction for 2012, and was awarded a silver IPPY (Independent Publisher Book Awards) for Multicultural Nonfiction Juvenile Teen/YA. 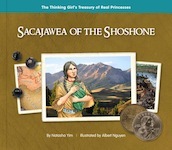 In Oct. 2012, Goosebottom Books published Sacajawea of the Shoshone, a biography of Sacajawea of the Lewis and Clark expedition, an addition to their first series, The Thinking Girl’s Treasury of Real Princesses. In Jan. 2014, my picture book Goldy Luck and the Three Pandas, a re-telling of the Goldilocks and the Three Bears story with an Asian twist, will be released by Charlesbridge Publishing. My favorite character or subject so far is Sacajawea who was an amazing woman with an amazing story. Morgen: Congratulations. I wrote a ‘what happened next’ to the Goldilocks story, which was fun (she was arrested!) and was printed in the National Association of Writers’ Groups’ ‘Link’ magazine, alongside a really sweet illustration. 🙂 If applicable, can you remember where you first saw one of your books in a bookshop or being read by a member of the public?? Natasha: I did a reading of Otto’s Rainy Day at my local bookstore, and knew that the bookstore had purchased my book. I saw it on the shelf when I was browsing the bookstore with my kids, and pointed it out to them. But the one that got me really excited was seeing it at a Barnes and Noble bookstore. I can’t remember which one, but it wasn’t in my area. Natasha: No matter how many books you’ve had published, being accepted is still a tremendous thrill! It’s so hard to get your foot in the door these days, and just because you’ve been published before doesn’t necessarily make editors, publishers and agents jump at buying your next work. With the current publishing climate and economy, publishers are being a lot more selective about what they purchase, so even if the writing is great, the project has to be the right kind of marketable project for them. Natasha: Oh tons! I don’t let myself dwell on rejections because that can really derail a writer from what’s most important—continuing to write and submit your work. Rejection is part of the process and journey of being a writer. If I find myself getting down on rejections, I like to read up on very successful writers and their rejection stories like JK Rowling, John Grisham and Stephen King. Goldy Luck and the Three Pandas is my poster child for perseverance. By the time it hits the bookshelves, it would have been a nine year journey for that book! Morgen: Dean Koonz had over 500 apparently. You mentioned earlier about some of your successes, have you won or been shortlisted in any competitions, and do you think they help with a writer’s success? Natasha: Not competitions per se, as I don’t have time to enter many of them, but I submitted work and was awarded a grant from the SCBWI (Society of Children’s Book Writers and Illustrators) to attend the SCBWI annual conference in Los Angeles. My ten-minute plays are submitted to play festivals where there is a selection process for the final group of plays that will be produced and performed on stage. So far, my plays have been produced in venues around Northern California, Los Angeles, and Sydney, Australia. With the Los Angeles production, it was one of 16 selected out of 300 plus submissions, and for Sydney, I had submitted the play to the Short+Sweet Festival, and it was chosen out of 1500 submissions. I think it always helps with a writer’s success. First of all, you get the feeling of “I can do this”, second, it’s an ego-boost that your work is competitive or seen as selection-worthy. Natasha: I do have an agent. Her name is Karen Grencik of Red Fox Literary agency (www.redfoxliterary.com). I don’t think agents are vital to an author’s success in that agents don’t “sell” your work—your work has to sell itself. What I mean is that agents get rejection letters too. If it’s not the right project for that editor, whether you have an agent or not, the editor is not going to buy it. There are manuscripts that agents have not been able to sell for clients, and there are writers who have been successfully published without an agent. But agents are tremendously helpful when it comes to negotiating the language of the contracts, knowing which houses to submit your work to, and sometimes, because of their particular relationship with editors, getting great leads on submission opportunities. My agent submitted an Asian folktale I had written quite a few years ago. It had received several rejections in the past, and I had put it aside, but I got an email from my agent asking if I had any Asian multicultural stories or folk tales in my arsenal of work because she had received an email from an editor specifically asking for some. If she hadn’t received that email, I may not have had the chance to resurrect that story. Morgen: I like to think that something is the right thing but just for the wrong person. We have to keep going (or self-publish), don’t we. Are your books available as eBooks? If so what was your experience of that process? Natasha: Cixi, The Dragon Empress is available as an ebook through IPG (Independent Publishers Group), Goosebottom Books’ distributor. It’s sold in different formats including iPad, iphone and other android phones, Nook, Sony, and Kobe devices and is available for purchase on http://www.ipgbook.com/cixi–the-dragon-empress–products-9780983425656.php?page_id=21. I had nothing to do with the process which was all handled by IPG and the publisher. Morgen: Do you read eBooks? Natasha: I don’t read a lot of e-books because I still prefer to read print books. There’s nothing like the feel of book pages in your hand. However, I have an iPad, and I use it a lot for reading and editing manuscripts. I love not having to carry a stack of papers around with me which means I can edit or work on my manuscripts anywhere—doctor’s offices, my kids’ sporting events etc. I also use my iPad more when travelling. It does help not to weigh your luggage down with a pile of books. Morgen: Most people I’ve spoken to do prefer ‘real’ books, although most say it’s great to have a choice… especially if they want to go away. How much of the marketing do you do for your published works or indeed for yourself as a ‘brand’? Natasha: I didn’t do anything with my first book Otto’s Rainy Day. I was very naive back then about how marketing worked. But since then, I’ve learned a lot. I have a website: www.natashayim.com; a blog: www.imustbeamasochist.blogspot.com; a Facebook fan page for myself and for Cixi, The Dragon Empress: https://www.facebook.com/cixithedragonempress and https://www.facebook.com/natashayim.author where I post updates about my writing, and things related to Cixi, the book, and Cixi, the empress; a Twitter handle: https://twitter.com/#!/natashayim/; a LinkedIn page: http://www.linkedin.com/in/natashayim; and a Pinterest page: http://pinterest.com/natashayim/. I’ve also guest blogged or been interviewed by other bloggers (you can check these out on my blog), been interviewed on BlogTalk radio, done book events/readings and signings, done blog tours, and travelled all over Northern California for school visits. Morgen: Marketing’s usually the answer to ‘what’s your least favourite aspect of writing’, mainly because of the time it takes but it sounds like you’re as busy as anyone. Hopefully you’re enjoying it all. Do you write under a pseudonym? Do you think they make a difference to an author’s profile? Natasha: I don’t write under a pseudonym, but I use my maiden name Natasha Yim as my writing name instead of my married name Natasha Carter. I don’t think it makes much difference to an author’s profile unless you are writing books in drastically different genres such as juvenile and erotica. I do think it’s important to maintain the same name for name recognition and branding. I had published Otto’s Rainy Day before I was married, and decided to keep Yim as my writing name after I was married so there wouldn’t be any confusion on future books that Natasha Yim and Natasha Carter or Natasha Yim Carter is the same author. It’s also nice to have something that’s my own identity separate from my identity as a wife and mother. Morgen: Natasha Yim is probably more Googleable, which authors should consider before embarking on a writing career. If any of your books were made into films, who would you have as the leading actor/s? Natasha: I have no idea—preferably someone who would do the characters justice. Morgen: Did you have any say in the title / covers of your books? How important do you think they are? Natasha: Book titles are extremely important as it can determine how booksellers and your publisher’s marketing department will place and market your books. From a parent’s standpoint, I have picked up books to look at because the title intrigued me or my kids and bypassed books that didn’t sound very interesting. From an author standpoint, I think the final say of book titles belong to the publishers, but I’ve worked with wonderful editors who have given me some say, even though the final titles may not have been mine. Otto’s Rainy Day began as “Otto’s Rainy Day Games”, but Charlesbridge Publishing shortened it. The manuscript for Goldy Luck and the Three Pandas was “Goldy Luck and the Three Chans.” The editor had the idea to have “the three Chans” illustrated as Panda bears, but I wanted to keep the original title because I thought “the Three Chans” was inherently funny which serves to convey the humor in the story, and that having the Three Pandas in the title along with the illustrations might be overdoing it a bit. However, the publisher was concerned that kids wouldn’t know what a “Chan” was even though the first page introduces Mr. Chan, Mrs. Chan, and Little Chan, and that it could make the difference between a successful book and one that never quite finds its market. I conceded because the publishers are in the business of knowing the market and how to sell books. Morgen: You do have to hope that they know what they’re doing, although I know of authors who have had to sell a book they’re not 100% happy with which is a really shame. What are you working on at the moment / next? Do you manage to write every day? Natasha: I’m currently working on a picture book, a multi-cultural young adult novel, and a children’s play based on The Thinking Girl’s Treasury of Dastardly Dames series. I do try to write everyday, usually between 5 am. – 7 am. before my kids get up for school and for about 4 hours when they’re in school. Natasha: I don’t generally get writer’s block. I have more project and ideas than I have time, so I’m constantly working on something. That said, I sometimes get stuck on certain elements of my story. Because I usually have multiple projects, I will often switch to a different project if I’m stuck on one and need a break or some distance from it. Morgen: Me too. I don’t generally stick to one genre so it helps. Do you plot your stories or do you just get an idea and run with it? Natasha: I never used to do plot outlines because that method didn’t work well for me as I never knew how the story ended until I got there. However, with my latest work in progress, my young adult novel, I’ve outlined the whole book and I find it extremely helpful to have a road map to know where I’m going with my story. It’s also easier to pick up where I left off if I haven’t been working on it for a few days because I can always refer back to my outline to jog my memory. Morgen: It’s funny. I’m the same. I hardly planned anything but the novel I wrote for last year’s NaNoWriMo is the first in a crime series… or at least I thought it was going to be the first, but I think I’ve written cameo pieces for a few in one so I’m going to write a synopsis and see if that helps. Do you have a method for creating your characters, their names and what do you think makes them believable? Natasha: Not specifically. One writer friend of mine finds it helpful to “interview” her main characters, another likes to note on index cards specific personality traits, but for me these methods are really static. I find I can’t get into my characters’ heads by creating artificial personality traits. So, I generally have an idea of what they’re like ie. shy, clumsy, poor self-esteem etc. and then, especially in revisions, try to make sure that all their reactions, emotions, interactions with other characters in the story etc. are consistent with their personalities. Morgen: It is important to get the characters right… I think more so than the plot because if we don’t empathise with the characters then the reader’s not going to care what happens with them. Do you write any non-fiction, poetry or short stories? Natasha: Yes. I have written non-fiction magazine articles and two children’s biographies about women in history: Cixi, the last empress of China, and Sacajawea. I love the research for non-fiction projects and learning a lot about my subjects and the time periods in which they lived. I don’t write poetry or short stories. Morgen: That’s a shame. I write very little poetry but I love short stories, and you never know when a short piece will grow legs and become a novel. The crime series I started began from a 300-word flash fiction. Do you do a lot of editing or do you find that as time goes on your writing is more fully-formed? Natasha: Absolutely! My computer hard drive is filled with different versions of the various stories I’ve written. Goldy Luck and the Three Pandas is vastly different from the story I originally wrote back in 2005. I have edited manuscripts as many as 12 – 15 times before it gets to a publisher, then if there is interest, the editors usually have more revisions they want you to do. Morgen: Wow. I think the most I’ve done is seven and I thought that was enough. Do you have to do much research? Natasha: Non-fiction projects are generally entirely based on research. However, I tend to do some research too for fiction projects. For example, I have another Young Adult story I’ve been conceptualizing. It’s historical fiction, so I’ve been doing a lot of research on the time period and the country at that time (it’s set in China). Even with stories that are completely fictional, I research certain elements such as settings, behavioral patterns, job occupations etc. that might relate to the work in progress. Natasha: If I write at home, I find it distracting to have background noise like music or the T.V. on when I’m writing, but when I take my work to a public place like a coffee shop, I find that I get into a zone and can tune out the (often) loud, blaring music in the background. Morgen: I usually listen to classical music so words don’t disturb me but I’ve changed my iPod to My Top Rated so it’s playing allsorts and as you say, I’m able to zone out. What point of view do you find most to your liking: first person or third person? Have you ever tried second person? Natasha: It depends on the project. I’ve written primarily picture books, and those are almost always third person. But with my Young Adult project, I’m writing in 1st person, as it brings the reader in closer proximity to what the character is thinking and feeling. I’ve always detested 2nd person POV, and have never written from that perspective. Morgen: A lot of people do. It certainly wouldn’t work for longer pieces. I have Jay McInerney’s Bright Lights, Big City and have never got to the end. Do you have pieces of work that you think will never see light of day? Natasha: Yep. There are projects I’ve started that I’ve abandoned because the topic and characters don’t excite me that much or I’ve lost interest or as my agent pointed out on one “there are too many books coming out right now with this theme”. And there are others I’ve put aside, but keep coming back to. When the characters or their stories haven’t completely left my consciousness or when I keep thinking about them years after I’ve written a word on that project, I know they’ll never rest until their stories eventually get told. Morgen: I love it when they come to life like that. What’s your least favourite aspect of your writing life? Natasha: Not having enough time to write, and having to interrupt the writing process when I’m on a roll because my other life as a Mom has to take priority. Morgen: Oh dear. I don’t have children but do have a dog to walk (or else he sits and stares at me until we go out). What advice would you give aspiring writers? Natasha: Keep writing, keep revising, and never give up. Natasha: I like to read the classics like Jane Austen, John Steinbeck and William Faulkner, quirky books like any of John Irving’s works and John Kennedy Toole’s A Confederacy of Dunces, and books that make me laugh like David Sedaris. I also love Louise Rennison’s The Confessions of Georgia Nicolson series. Not only do they have a wonderful, distinct voice, but they’re hilarious. I’m reading a lot of YA right now because that’s what I’m interested in writing. Morgen: I saw Louise do a talk at the Oxford Literature Festival in April 2011, she was so funny. If you could invite guest from any era to dinner, who would you choose and what would you cook? Morgen: I love those. Are you involved in anything else writing-related other than actual writing or marketing of your writing? Natasha: I meet with my writer’s group every 6 weeks or so, and I also try to attend the monthly meetings of the Redwood Writer’s Club of which I’m a member. I gave a presentation in May, along with my publisher, at the Asian American Heritage Celebration at the Foster City Library in California, and a couple of weeks before that, was on a panel with some of the other Dastardly Dame authors at Books Inc. in San Francisco. I also co-taught a writing workshop at the Mendocino Lit. Fest in my hometown of Ukiah, so I do occasional presentations, workshops and book events. I also enjoy going to a few writing conferences throughout the year. Morgen: Oh so do I. I’d go to everything going if I had the money. What do you do when you’re not writing? Natasha: I spend a lot of time volunteering at my kids’ school, either in their classrooms or on field trips. I also enjoy baking and reading, and once in awhile, when I’m feeling really stressed, I’ll go in for a relaxing massage. Natasha: The websites that have been most helpful to my writing have been ones put out by editors and agents. My favorites are Query Shark (http://queryshark.blogspot.com/) where writers can submit query letters and agent Janet Reid critiques them online; Pub Rants (www.pubrants.blogspot.com), agent Kristin Nelson’s blog. She has a great series on how to negotiate your own contract; the Society of Children’s Book Writers and Illustrators website (www.scbwi.org) the must-join organization for all children book writers, and the Children’s Book Insider, (www.write4kids.com) with all kinds of helpful information, articles, instructional vlogs about writing and publishing for children’s writers. Natasha: I’m on Facebook, LinkedIn, Twitter, and I just joined Pinterest. I’m not sure how useful they are in terms of marketing and selling your books, but they’re great to connect me to other writers and in that way, help me be known to others in the online community. Networking sites are about…well, networking…so the important thing is to interact with the writers and readers online by posting comments, questions, cheering your fellow writers on or encouraging/supporting their literary efforts and accomplishments, and they’ll do the same for you. I’ve found bloggers on line who have hosted me on their blogs or interviewed me or offered to do a review of my books. And any exposure I can get for me and my books is generally a good thing. That said, these sites can be all-consuming which takes me away from actually writing, so I have to be more disciplined with setting a time-limit for myself on how long I should be browsing on these forums. Morgen: I love social networking and for me, they all have different purposes, but as you say they’re great for interaction. What do you think the future holds for a writer? Natasha: E-books is changing the face of publishing, and not always for the better. But I still see a place in the world for print books, especially picture books because kids still love to turn the pages. The intimacy you share with your child in reading and exploring a print picture book isn’t quite there when you look at something on an e-reader. That said, there are advantages to ebooks like when travelling. I’ve discovered that my iPad is invaluable for reading and working on manuscripts so I’m not carrying around an unwieldy stack of papers and it makes my luggage a lot lighter when I load reading material on my iPad. Morgen: I use my iPad too, the Kindle app for books. I love it. Where can we find out about you and your work? Morgen: Thank you, Natasha. It’s been great chatting with you. Clouds of dust swirled across the plains, kicked up by galloping horses. Screams shattered the autumn air. Arrows arced in the crisp blue sky, sprung from Shoshone bows, but they were no match for the Hidatsa warriors’ guns. Through the smoke of musket fire, Sacajawea saw men fall. Her heart thudded against her chest. She raced over brush and brambles, the berries she had been picking scattering around her feet. If she could cross the river, she might be able to get away. One minute, her legs churned against the swift current, the next, a pair of muscular arms scooped her up, carrying Sacajawea far away from her tribe and family—and into history. 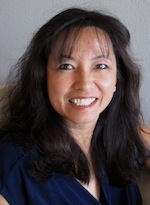 Natasha Yim is an author, freelance writer, and playwright. Her picture book, Otto’s Rainy Day (Charlesbridge Publishing) was a Kids’ Pick of the Lists selection. She has published articles in Highlights for Children, Appleseeds, and Faces magazines, and her ten-minute plays have been performed in venues around Northern California, Los Angeles, and Sydney, Australia. 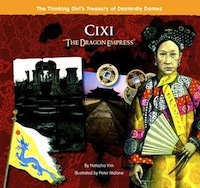 Her picture book biography, Cixi, The Dragon Empress, was released by Goosebottom Books (www.goosebottombooks.com) in fall 2011. Natasha’s upcoming books, Sacajawea of the Shoshone (Goosebottom Books) is due out in Oct. 2012, and Goldy Luck and the Three Chans (Charlesbridge Publishing) is slated for a January 2014 release. Thanks, Morgen, for the great interview! You’re very welcome, Natasha. I’m delighted you could join me. Great interview, Morgen & Natasha! Very thorough. Thanks for the writing insights. You’re very welcome, Jody. Thank you for visiting and leaving a message. I’ve passed it on.